i have to admit that when i first went to carey kirkella's website, i was mostly curious that there was another photographer out there who spells her first name the same way as i do. 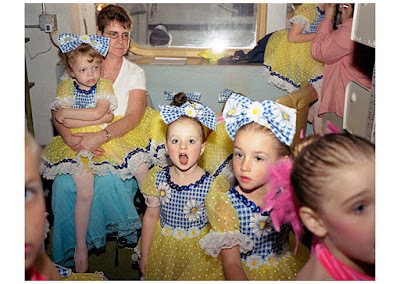 but in the end i couldn't resist these hilarious images of little girls at dance recitals. mostly because these pictures are unexpectedly not about social commentary: the parents are not exploiting their kids, and the kids don't look unhappy or mistreated, or pathetic. 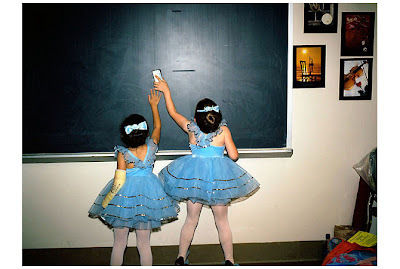 these are just amusing pictures of little girls being cute and annoying, caught red-handed by carey's flash. i love it so much. Hey there! I'm Carey Kirkella... thanks for the shout out! my friend checks out your blog all the time and told me about it. do you happen to know how you found my website? I really appreciate your thoughtful comments about my dance recital project. weird, I wonder how many "carey's" there are out there leading parallel lives :). i picked up a post card with the top image i posted on it. i can't recall where i got the card though.